Merry Christmas to all on this fine day! There is still some residual snow on the ground so that Christmas spirit lives strong in the Midwest! Every year my wife and I, put together some kind of clever Christmas Card. Last year we were all Christmas Ornaments on our tree. The year before that we were on the beach with a Christmas tree drawn in the sand, I wish we were still on the beach! This year, well this year was a bit more creative! Now you look at that and think, wow that must have been cleverly planned right? Not really, I recall a lot of frustration, maybe even a little lovers spat between me and my wife, and a baby who would not cooperate with any of our demands, regardless of cookie bribery! Our original plan was to have Michael staring at the on lookers with his head nestled in his hands, he makes it really cute looking, but he would not cooperate for anything! We ended up putting him on a wobbly foot stool and taking what we could get. If you look at all of the before pictures you will notice he is not on a green screen making it a bit harder to cut out later, but the green screen/camera combo kind of freaked him out a bit! You see the thing is, not every shoot we do can be planned like we want it. I really wanted that pose to work, but it didn’t and you know what? I am glad it didn’t because this card really captures our family! Not that I am oblivious to my sons whereabouts when my camera is in my hand, I say that very facetiously! However, it works and I love it. We had a problem and we worked it out, my wife came up with our other 2 poses based on the only picture we could get of Michael. I am already pondering next years!!! Happy Holidays to you and yours!!! 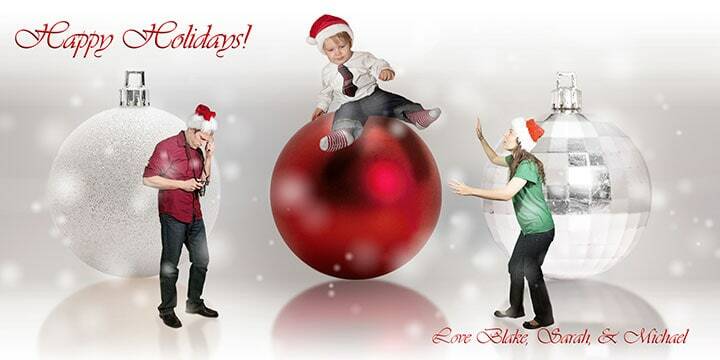 Really cool processing Blake, I wish you and your family a very Merry Christmas. Thanks Steve! I wish you and yours a Merry Christmas and a Happy New Year as well! Good stuff again Blake. Merry Christmas to you and yours! Thanks Paul! You too my friend! No problem it is my pleasure! Merry Christmas to you too Damien! Dude – We got your card and I was wondering how you put all of it together…. ! Green screen ? Moving up in the photo world. Nice work Blake. Talk to you soon.